An anniversary edition as unforgettable as a night of celebration! Geneva, April 2018 – The Maison Caran d’Ache is celebrating 20 years of its iconic Léman collection by creating a must-have writing instrument. The Léman de Nuit anniversary edition reveals a hue as deep and as light as the waters of Lake Geneva on a night of celebration! 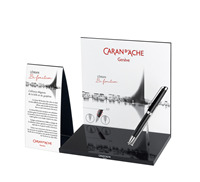 For 20 years now, Caran d’Ache has been paying tribute to the vibrant colours of Lake Geneva. It is an eternal source of inspiration for the Geneva-based company, which recreates the beauty of this lake of endless reflections on the Léman writing instruments collection. Thanks to silky lacquers and daring guillochages, the fountain pens, ballpoint pens, roller pens and mechanical pencils in this collection showcase the colour expertise of the Maison Caran d’Ache and reveal the know-how of its master-artisans. To celebrate 20 years of the Léman collection, the Maison Caran d’Ache presents the Léman de Nuit anniversary edition. This brand new edition explores the deep hue of the expanses of the lake under the shimmering light of Geneva's iconic fireworks. The writing instrument reflects the light over its elegant curves in an anniversary edition that is as festive as the illuminated sky on a summer night. The translucent black lacquer of the Léman de Nuit anniversary edition reveals the meticulous engraving work of Caran d’Ache’s master-artisans. The guillochage with a clou de Paris pattern brings points of light and shine to the body of the pen, like a firework on a starry night. The perfect alchemy between high-end writing comfort and a look that is elegant, refined and contemporary will quickly make this writing instrument a classic. Available as a fountain pen, ballpoint pen, roller pen and mechanical pencil, the writing instruments in the Léman de Nuit collection are entirely designed and produced in the Maison Caran d’Ache’s Geneva workshops. The collection is available from all points of sale and Caran d’Ache boutiques as well as from the eBoutique. Also refillable with a blue cartridge (F) or fibre cartridge black and blue, fine and medium. Mechanical pencil with rotary mechanism. Equipped with 0.7mm leads, small rubber included underneath the top of the instrument. 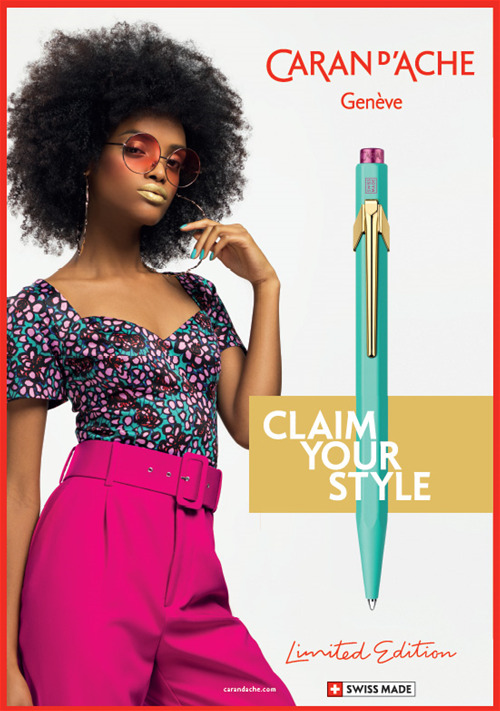 Located in Geneva since its inception in 1915, Caran d’Ache designs and manufactures the brightest colours and most advanced writing instruments, combining premium materials with the most innovative skills and technology. Drawing on more than a century of expertise, the Geneva-based Maison has been part of the grand tradition of Swiss manufacturing, and its instruments are recognised around the world for their outstanding quality. Each fine writing instrument and every luminous colour by Caran d’Ache is crafted in the Maison Caran d’Ache Maison workshops in Geneva, in accordance with the exacting requirements of the Swiss Made label and the brand’s deep commitment to social and environmental responsibility. 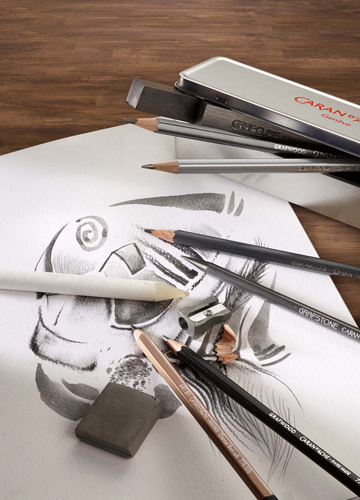 Caran d’Ache utilizes all of its experience and know-how to design products that foster creativity in every one of its customers, from budding creatives to the most renowned professionals. 6 pc Technalo Set - Assortment of 6 graphite pencils: 3 Technalo hardnesses (6B, 3B, B), 3 coloured Technalo RGB (Red 575, Green 719, Blue 159) + 1 brush with water chamber Medium. Technalo RGB and Grafcube RGB products are available individually and in multi-technical sets that include water-colourable art tools and essential accessories offering ultimate art-on-the-go convenience. With the Léman Bi-fonction, Caran d’Ache has once again enhanced its collection of Léman writing instruments, showcasing its versatile new design in fine writing and graphite. The Léman Bi-fonction offers the convenience of choosing between a ballpoint pen and a mechanical pencil, providing dual function in a single writing instrument. The rotating mechanism provides the Léman Bi-fonction with a smooth transition from the ballpoint pen to the mechanical pencil by a simple rotation of the pen barrel. 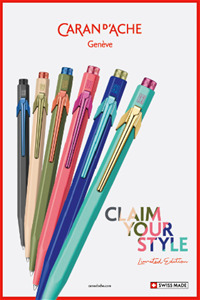 It's contemporary lines ensure optimum handling and outstanding writing comfort. Enjoy the elegant lines of the Léman's style without losing any of the convenience of a ballpoint pen. The Léman collection from Caran d’Ache pays tribute to the deep, vibrant colours hidden in the endless reflections of the lake. The silk and harmonious shades of the lacquers reflect all the subtlety and elegance of this watery world. With the Léman collection, Caran d’Ache emphasises its expertise in the field of colour, extolling the know-how of its master craftsmen. "Claim Your Style" by owning an 849 from this new collection and show the world your style.